One of the most awe-inspiring wildlife spectacles in the world is the scene of brown bears catching salmon at Katmai National Park. During the summer sockeye salmon runs, brown bears congregate on the Brooks River to capture salmon jumping the Brooks River waterfall, and later to feed on carcasses of dead salmon washed downstream after spawning. The annual salmon feast sustains the dense bear population found in Katmai which is home to an estimated 2,200 bears – the largest protected bear population in the world. I spent a month exploring Katmai in the late 1970s. Back then I sometimes was the only person watching bears at the falls. Since then, the popularity of this amazing wildlife spectacle has grown exponentially. During the height of the summer tourist season, hundreds of visitors may crowd the river daily hoping to see the bears and salmon. Between the coming and goings of tourists, the float plane landings and barge landings, the Brooks River bears are suffering from the growing human encroachment. Dr. Barrie Gilbert, emeritus senior scientist at Utah State, and his graduate students have studied the human-bear interactions at Katmai National Park for decades. Their studies document that bears, particularly the most vulnerable bears – those with cubs – alter their behavior to avoid areas with heavy human presence. The area surrounding Brooks Camp was once a primitive fishing lodge. Over the years the tourist infrastructure has incrementally expanded to include a campground, living quarters for park staff, a visitor center, and landing facilities for float planes – all within prime bear habitat. According to bear biologist Gilbert, there is no other comparable development in prime bear habitat anyplace in the world. As a consequence, bears attempting to get to the river to feed must run a gauntlet of humans. Bears are sometimes hazed by armed rangers using air horns, firecrackers, and rubber bullets to move bruins away from the lake and river to permit visitor movement. Such hazing may prevent dangerous interactions between humans and bears, but it’s debatable whether harassment of wildlife is appropriate in a national park where wildlife is supposed to be protected. To try to reduce bear-human interactions, Katmai National Park personnel and National Park Service staff spent 10 years to produce, vet and finalize its Brooks River Area Development Concept Plan. The plan – which was finalized 1996 – proposed moving all developments from the river area to a low bluff on the south side of the river, freeing up the north side of the river as a “people-free” zone for the exclusive domain of the bears. Use of the river area would become a restricted day use area. This was smart strategy, grounded in the best wildlife science. But political interference – prompted in part by some tour operations and others who were opposed to any restrictions on access for tourist – resulted in lack of funding for implementation of the plan. The plan has sat in limbo for close to 20 years. As a result, the NPS has tried some bureaucratic short-term fixes, including an amendment to its plan which proposes constructing of a permanent 1,550-foot-long, elevated vehicle/pedestrian bridge over the lower Brooks River to connect facilities on either side of the river. However, some Katmai lovers (including me) and former park officials believe the construction of a permanent (and expensive) $7.4 million bridge will likely ensure that no commercial facilities will be moved as originally planned, and will only lead to increased human use of the entire Brooks River area to the detriment of the park’s bears. Echoing Bane’s concerns, bear biologist Gilbert has withdrawn his original support for the plan. Two other bear biologists have also withdrawn their endorsement of the now amended plan. Gilbert compares Alaska State Park’s McNeil River bear viewing policies with those in Katmai. Gilbert points out that visitation at McNeil River has been strictly limited to 10 people per day, in the mid-day period, all confined to a single gravel pad above the falls. Thus, he notes, human activity is limited in time and highly predictable in space so bears can adapt or habituate. This also permits bears a much broader range of locations to obtain fish undisturbed by mobile humans. National Parks are mandated to protect the resources within their borders. We can expect humans to adapt to the bears, not the other way around. Reducing conflicts and exposure to human intrusions should be the guiding philosophy for park management. The bears do not have a voice, but you do. Please write Secretary of Interior Jewell and ask her to give Katmai bears some space. 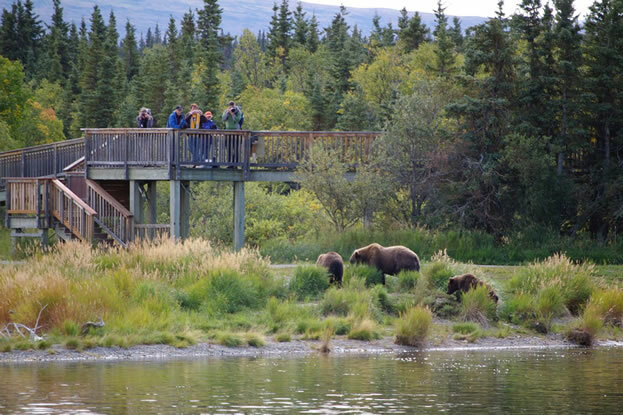 Brown Bears and people, Viewing Platform, Brooks Camp, Katmai National Park. Photo by Barrie Gilbert. George Wuerthner is an ecologist and former park ranger who has visited hundreds of national park units including every park unit in Alaska. He has published of 38 books. His most recent is Protecting the Wild: Parks and Wilderness the Foundation for Conservation. Write Secretary of Interior Sally Jewell immediately and ask her to stop construction of a permanent bridge over the Brooks River, and ask that the NPS begin a new Development Concept Plan that puts the bears’ safety and needs first. If you have time, send copies of your letter to the following folks. These places are not zoos and profit-making ventures. I’m sure the majority of visitors would be cooperative with limits on human traffic? Don’t bet on it. The same problem exists in Yellowstone, Grand Teton NP and anywhere else there are charismatic mega fauna… only to a smaller degree as there are fewer bears who are visible from the road in those parks. Visitors to the parks, these days, demand to see what they saw online or heard about and get pretty rude when informed that they can’t have it all. The trend of late seems to be the misconception that the word “park” implies petting zoo settings and picnics with bears and whatever else they want to see like they are in some kind of TeeVee reality show. And then there are the Internet warriors who want selfies in front of wild animals… and dangerously close, which is how a couple people were gored by bison in YNP this year. The idea that wild means wild is lost on those who expect that sense of instant gratification after they paid so much to go to where the wild things are. They want what they want and get pissed if it doesn’t work out for them. I can image this is a huge problem in Yellowstone. I worked in Yellowstone. And yes, it is a huge problem. On a regular basis I witnessed the inability of wolves, bears, elk, etc. to freely move about, negatively impacting their feeding and the feeding of their young. It thoroughly disgusted me, and still does. I recall my visit to Hurricane Ridge, WA, wildlife viewing area, some 20 years ago. While there, I witnessed a woman baiting/feeding a sub-adult deer with a bag of Cheetos, smack in front of a Warning signage, do not feed the animals. The plans to accommodate growing numbers of visitors encroaching on Brooks Falls is guaranteed to negatively impact the immune systems and integrity of the Habitat of the Bears at Brooks Falls. The issue George W has direct bearing on the protection and management of bears and other megafauna throughout the National Park System. There is no other designated bear viewing site in North America, either public or privately managed, that permits the intense human use pressures common at Brooks River. The impact to particularly sensitive bears, especially sows with cubs, is unfortunate to say the least. The NPS has succumbed to commercial and political pressures refusing to take actions to either limit visitation or remove developments and intense access pressures from sensitive bear habitat. I vaguely remember walking past the falls on my way to the valley. The spectacle of fish leaping and leaping until they passed the falls was captivating. That was in 1969. The bears that I saw were nearly unaffected by human presence except for the one bear that dashed across the road ahead of me. I would not have enjoyed watching bears from that landscape dominating platorm knowing how much they were affected by my presence close by. I suggest that annoying crowds be replaced by webcams so the world can watch the bears live in peace.